[ABOVE] A portrait of the photographer William Arthur Thomas (1867-1927). The son of the veteran Hastings photographer John Wesley Thomas (1831-1908), William Arthur Thomas took over his father's studio at 45 George Street, Hastings around 1900. This portrait was probably taken around 1886 when William was working as a photographer in his father's studio. William Arthur Thomas was born in Hastings, Sussex in 1867, the son of Jane and John Wesley Thomas*, a professional photographer. [The birth of William Arthur Thomas was registered in Hastings during the second quarter of 1867]. William Arthur Thomas was the third boy born to John and Jane Thomas, but he appears to have been the only one of John Wesley Thomas's sons to reach adulthood. William Arthur Thomas probably served his apprenticeship as a photographer under his father John Wesley Thomas and we can assume that he assisted his father at his studio at 45 George Street, Hastings until John Thomas retired from the business around 1900, when he was in his late sixties. 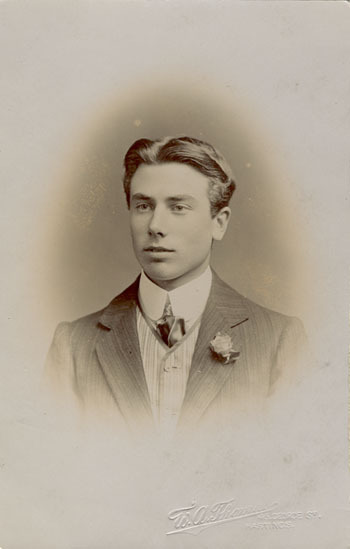 At the age of twenty-one, William Arthur Thomas was a founder member of the Hastings & St Leonards Photographic Society which held its inaugural meeting at the School of Art, Claremont, Hastings on 22nd October 1888. 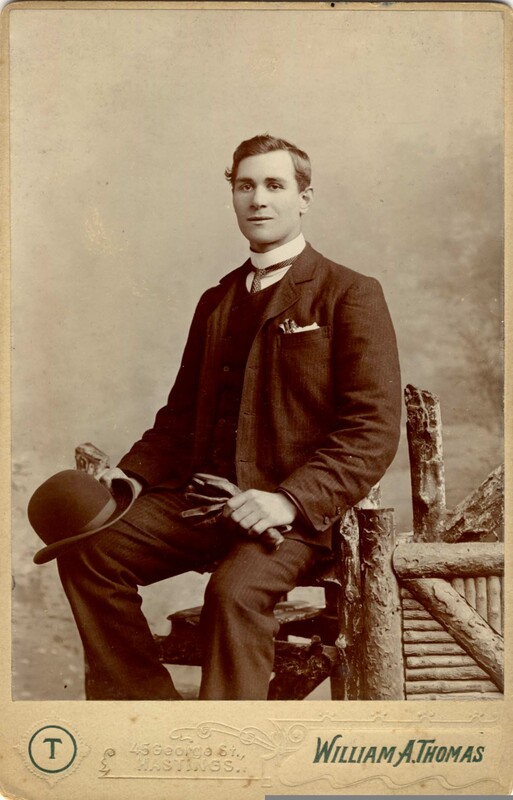 When the 1891 census was taken on 5th April 1891, William Arthur Thomas was residing at 45a George Street, the living quarters attached to the photographic studio at No. 45. William A. Thomas, an unmarried man of twenty-four, is entered as a "Photographer" on the census return. William Thomas shared his home with Ellen Elizabeth Thomas (born 1848, Hastings), an unmarried cousin who served as his housekeeper. Towards the end of 1891, William Arthur Thomas married Agnes Shoesmith (born 1869, Hastings), a daughter of Ann and John Shoesmith, a furniture broker with business premises in High Street, Hastings. In 1894, the couple became the parents of a boy named Arthur Wesley Thomas [ Arthur's birth was registered in Hastings during the second quarter of 1894]. 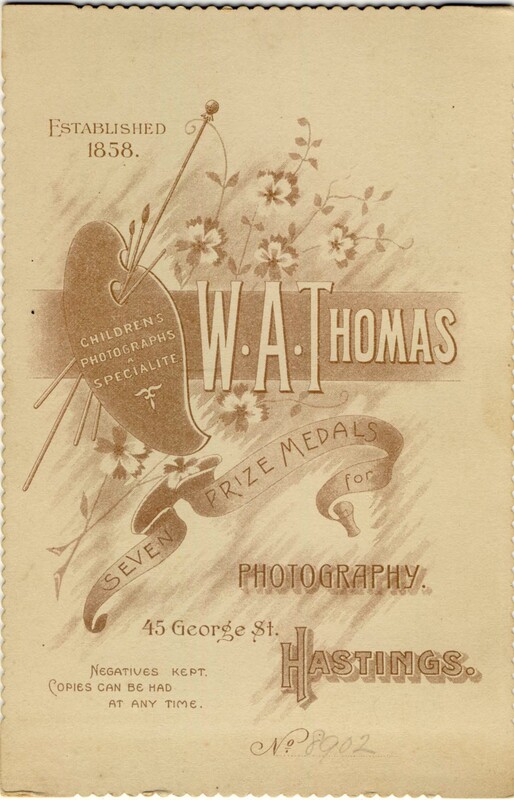 After his father retired from the photography business around 1900, William Arthur Thomas took over the photographic studio at 45 George Street, Hastings. From 1900, the studio carried the name of "William A. Thomas". When the 1901 census was taken, William and Agnes Thomas and their six year old son, Arthur, are recorded at 45 George Street, Hastings. Interestingly, William A. Thomas is described on the census return as a "Photographer (Professor)", aged 34, working "at home" on his "own account" (i.e. self employed). When the 1911 census was taken, William Arthur Thomas, his wife Agnes and their teenage son are recorded at 45 George Street, Hastings. 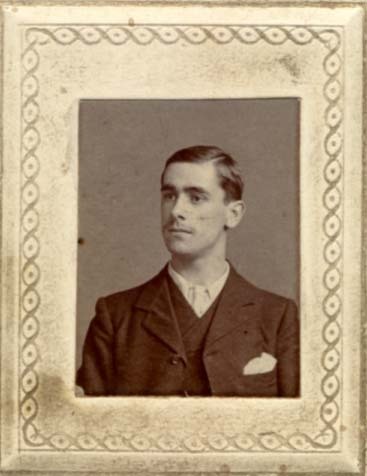 William Arthur Thomas is described on the census return as a "Photographer", aged 44. William's sixteen year old son, Arthur Wesley Thomas, gives his occupation as "Pupil Teacher of Handicraft in Elementary School". 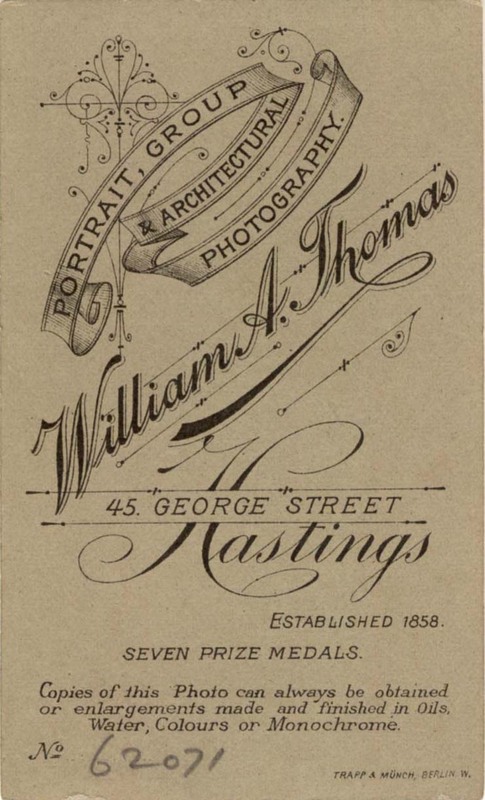 The studio of William A. Thomas at 45 George Street, Hastings was still in business in 1918, but is not listed in local trade directories after 1922. William Arthur Thomas died in Hendon in 1927, aged 60. During the 4th Quarter of 1891, William Arthur Thomas married Agnes Shoesmith (born 1869, Hastings), a twenty-two year old assistant school mistress. Agnes Shoesmith was the daughter of Ann and John Shoesmith, a furniture broker with business premises in High Street, Hastings. Agnes Shoesmith was born in Hastings during the 3rd Quarter 1869. 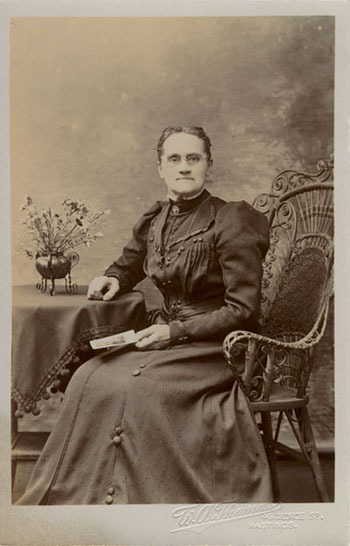 Agnes was the second youngest of 9 children born to John Shoesmith (1831-1902) and Ann Honeysett (1832-1908). 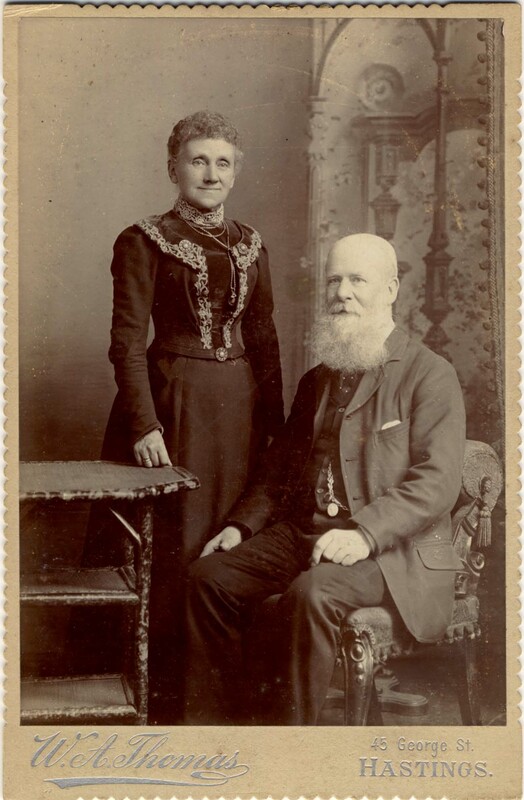 When John Shoesmith married Ann Honeysett (born 1832, Dallington, Sussex) in 1851, he was working as a labourer, but around the time Agnes was born in 1869, he had set himself up as a furniture dealer in the High Street of Hastings. Agnes Shoesmith had at least 8 siblings: Martha (born 1852, Hastings), John Shoesmith junior (born 1854, Hastings), Ann (born 1856, Hastings), Frank Shoesmith (born 1858, Hastings), Lydia (born 1860, Hastings), George Shoesmith (born 1861, Hastings), Benjamin Shoesmith (born 1865, Hastings), Frederick Shoesmith (born 1867, Hastings) and Ellen Shoesmith (born 1871, Hastings). When the census was taken on 5th April 1891, twenty-one year old Agnes Shoesmith was employed as a school teacher. (The census return records Agnes Shoesmith as an "Assistant Mistress", aged 21). 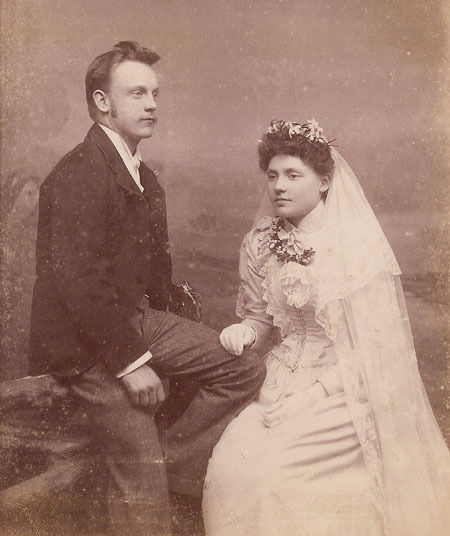 Agnes presumably gave up her teaching career when she married William Arthur Thomas towards the end of 1891. In 1894, Agnes gave birth to a son named Arthur Wesley Thomas [ Arthur's birth was registered in Hastings during the second quarter of 1894]. 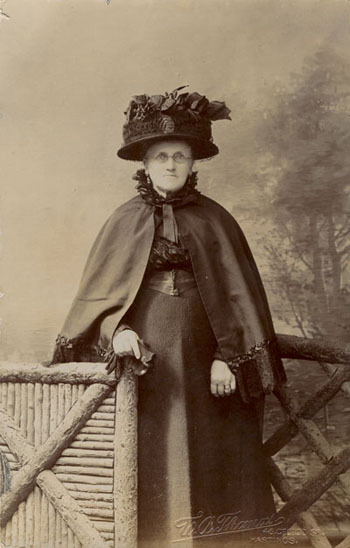 Arthur Wesley Thomas did not become a photographer like his father and grandfather, but chose instead to pursue a career as a school teacher, as his mother had done before her marriage. 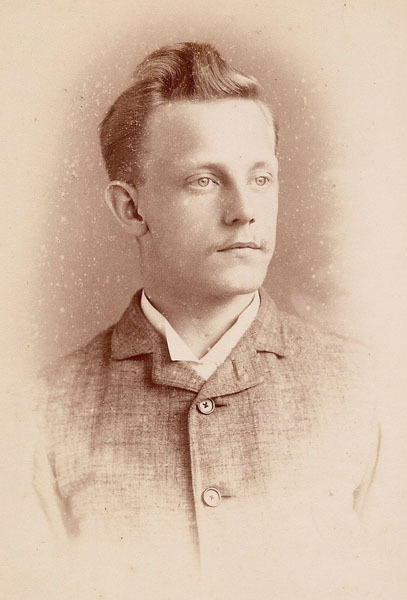 By 1911, sixteen year old Arthur Thomas was working as a "Pupil Teacher of Handicraft" at a local "Elementary School". 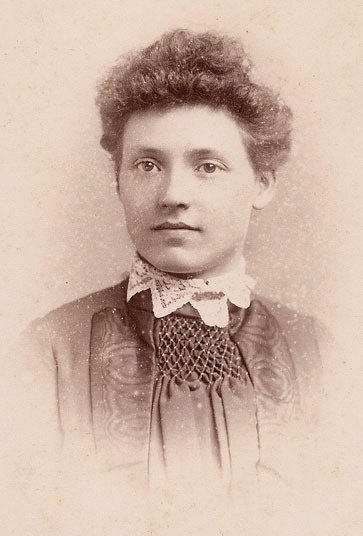 Sue Peyman-Stroud, Arthur's niece, reports that Arthur Wesley Thomas later became a school teacher in London. [ABOVE] A portrait of Agnes Shoesmith (1869-1951), the young school teacher who married the Hastings photographer William Arthur Thomas in 1891. 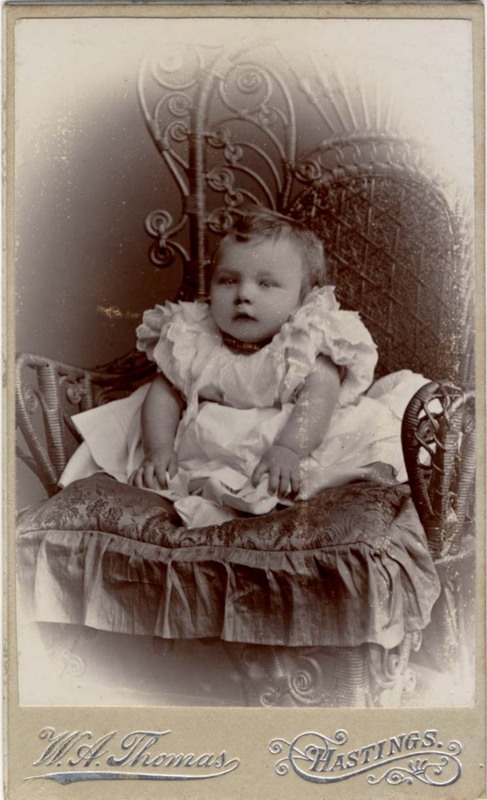 [ABOVE] Portrait of a baby on a silk cushion. 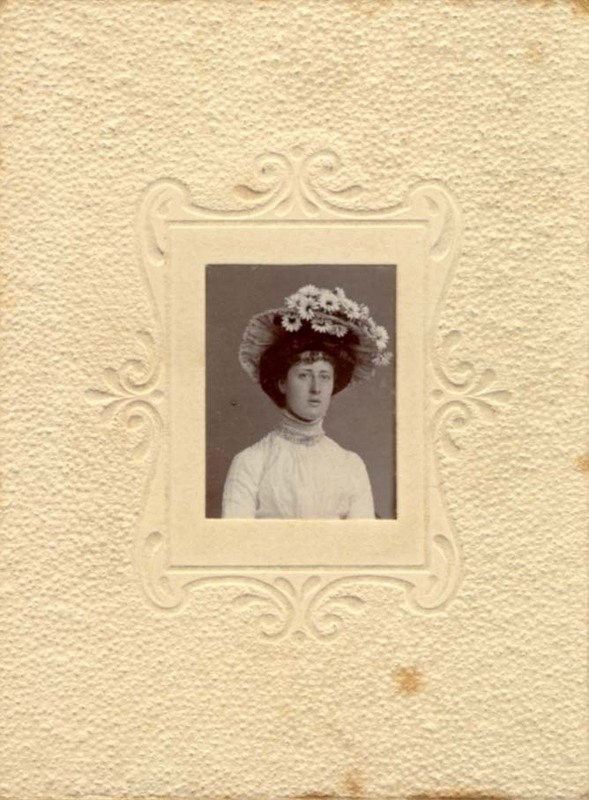 A carte-de-visite portrait by W. A. Thomas of Hastings (c1902). Negative No.62,071 [ABOVE] The reverse of a carte-de-visite produced by William A. Thomas at 45 George Street, Hastings (c1902). [ABOVE] Portrait of a young woman. A carte-de-visite portrait by W. A. Thomas of 45 George Street, Hastings (c1905). [ABOVE] A portrait of an elderly couple. A cabinet format photograph by W. A. Thomas of 45 George Street, Hastings (c1907). Negative No.8,902. [ABOVE] The back of W. A. Thomas's cabinet portrait of the elderly couple shown on the left. The established date of 1858 refers to the year that the photographer's father, John Wesley Thomas, set up his first photographic studio in Hastings. Five of the "seven prize medals for photography" had been awarded to the studio when it was owned by William Thomas's father. 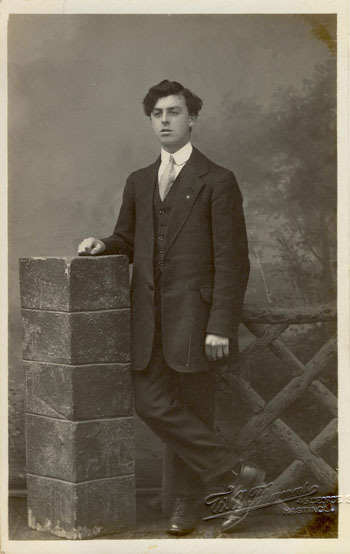 [ABOVE] A portrait of young man sitting on a rustic fence placed in front of a studio backdrop. A cabinet format photograph by William A. Thomas of 45 George Street, Hastings (c1909). Negative No.11,046. [ABOVE] A portrait of an elderly woman. A postcard portrait by W. A. Thomas of 45 George Street, Hastings (c1910). Negative No.12,360. [ABOVE] A portrait of a middle-aged woman. A postcard portrait by W. A. Thomas of 45 George Street, Hastings (c1910). Negative No.12,349. [ABOVE] A portrait of a young man. A postcard portrait by W. A. Thomas of 45 George Street, Hastings (c1910). [ABOVE] The trade plate of photographer W. A. Thomas of 45 George Street, Hastings, blind-stamped in the bottom right-hand corner of a postcard portrait (c1910). [ABOVE] A vignette portrait of a young man. A postcard portrait by W. A. Thomas of 45 George Street, Hastings (c1910). 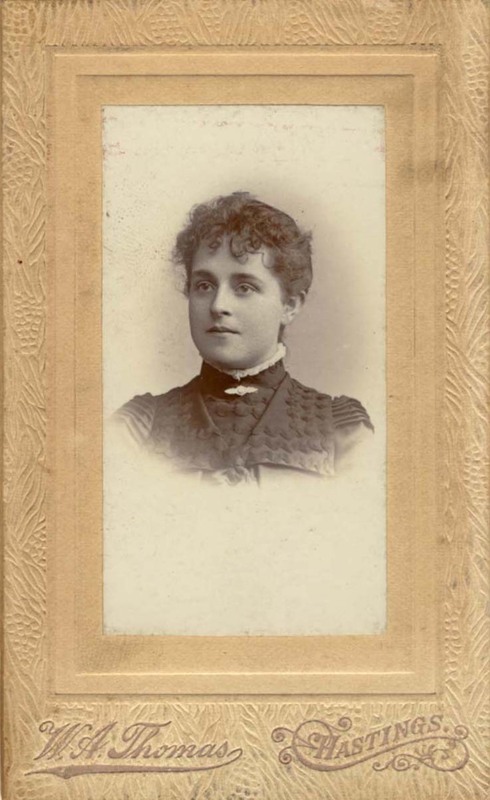 [ABOVE] The reverse of a carte-de-visite produced by William A. Thomas at 45 George Street, Hastings (c1902). At this date, William Arthur Thomas was continuing to use his father's sequence of photographic negative numbers (i.e. 62,071), but within a few years he had started his own negative register, with numbers running from 0001 to 12,000 and beyond. I am grateful to Sue Peyman-Stroud who kindly provided the portraits of John Wesley Thomas, his son William Arthur Thomas and their respective wives. Sue Peyman-Stroud is the great grand-daughter of Annie Shoesmith, the sister of William Arthur Thomas' wife Agnes Shoesmith (1870-1951).